When I lived in Japan, it was impossible not to notice what a major role bikes play in day-to-day life. They aren’t at all seen as ‘toys’ or a way to stay-fit, like we see them here. I didn’t see any roadies in skin suits out on training rides. I didn’t see hipsters on single-speeds hangin’ at the coffee shops, or BMX-ers in the parks building dirt jumps. In fact, oddly enough, single-speeds may actually have banned there – though I’m not sure about that. Instead it seemed to me that the Japanese see bikes as purely a practiacal means of transportation – you see the Japanese wearing business suits as they ride to work, or balancing their kid in a bike seat as they also carry groceries home from the local markets. 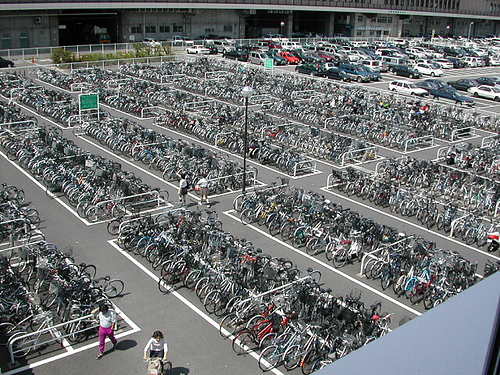 Near almost every train/subway station in Tokyo, you’ll find a massive bike-rack/lot, just PACKED with bikes (see photo – it’s nuts!). In a city like Tokyo, with a daytime population of more than 27 million, bikes free people from the extraordinary costs of owning, parking and operating a vehicle in such a space-starved metropolis. Even with the amazing public transportation system that they have, and believe me, it is amazing – bikes are still a common choice for transportation. In my opinion, bikes are truly the the great human transportation invention. Sure air planes are impressive. The space shuttle is pretty cool, and I hope to one day own a special edition Bugatti Veyron, but the bike is the one mode of transportation that you can always count on. Poor, or wealthy, bikes serve to get people where they need to go. And in the wake of the recent and terrible disaster in Japan, with power outages, roads blocked to vehicles, I’d imagine bikes may continue to come in pretty handy. 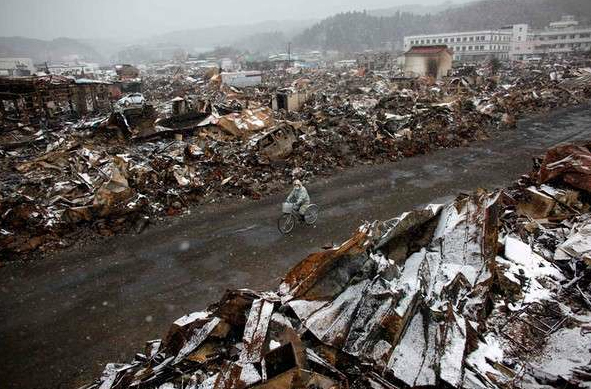 If you can, please consider making a donation to help those affected by the Japanese earthquake and tsunami. I was able to donate directly through a local grocery store (Save On Foods) today. Here is a link the Red Cross if you want to donate on line. I also did some more digging on the net, and found that this relief group seems pretty legit. Japan needs help. Bikes are simply a “practical means of transportation”. Hear Hear!